Mobile tech company Syniverse commissioned some research prior to MWC Asia to look into consumer attitudes to sponsored mobile usage in the region. 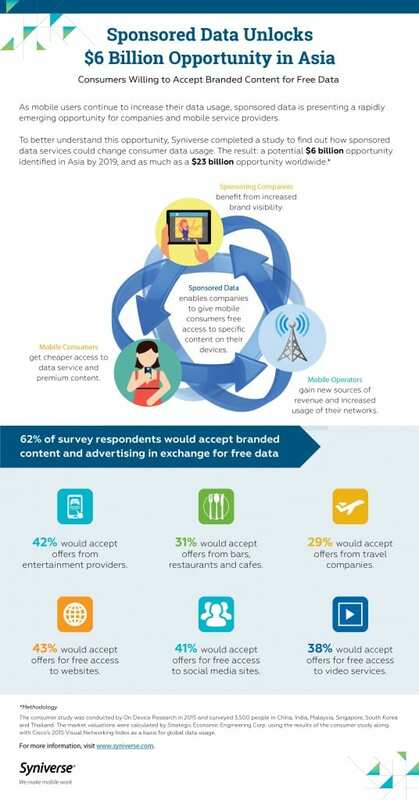 The headline findings were that almost two thirds of Asian punters (62%) are willing to accept sponsored data packages in return for free data access. This in turn could lead to an increase in data usage of 40%, which was then extrapolated with the help of economists at SEEC to a $6 billion revenue opportunity for operators and their partners by 2019. The research was conducted by On Device Research, who surveyed 3,500 people across seven Asian countries including China, India and South Korea. As well as the broad acceptance of sponsored data as a cheap way of getting online, half of respondents said they’d be happy to receives coupon offers from sponsors, The favoured type of sponsor was entertainment companies, so sponsored video content could well be the key opportunity. Here’s an infographic highlighting some other findings of the survey.